WATERPROOF bench scales with 190 STORM IP69K-rated polycarbonate indicator, stainless steel base and column, 8" and 12" square platforms, capacitive touch keys, interlocking commodity tray, carrying handle, and ColorZONE checkweighing for optimum efficiency. Large 1-inch-high clear and bold LCD readouts, ColorZONE checkweighing, rugged IP69K-rated polycarbonate indicator, and durable stainless steel base and column. Multiple sizes and capacities are available from 15 lb x .005 lb / 6 kg x .002 kg to 300 lb x .1 lb / 150 kg x .05 kg. Waterproof stainless steel bench scales from 15 lb to 300 lb capacities. Available in a variety of platform sizes ranging from 10" x 12" to 20" X 24" and a variety of indicators to suit any need. The optional battery allows the indicator to be used anywhere, or to keep you weighing even during power outages. These platform bench scales are ideal for smaller commercial and industrial users who demand top performance for their dollar. Perfect for inventory purposes, weighing bulk commodities or shipping and receiving departments. It weighs every 1/4 lb accurately up to a full 350 lb without any loose weights. 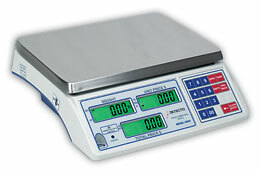 Cardinal's premier digital counting scale, the 2240 Series comes in capacities and increments ranging from 5 lb x .0005 lb ( 2 kg x .0002 kg)	to 100 lb x .01 lb ( 45.4 kg x .005 kg). 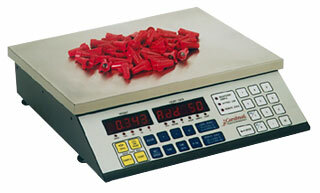 Take the guess work out of pricing with Cardinal's CS series price computing scales. Designed for portable use with a built-in rechargeable battery pack, the CS series is ideal for deli’s, bakeries, candy and coffee shops, convenience stores, produce markets, hardware stores and more. The full-featured, compact, affordable balance Ohaus Adventurer Pro balances are ideal for general laboratory, industrial and educational applications requiring multiple weighing units. Ohaus Adventurer Pro balances are the economical way to weigh with precision. 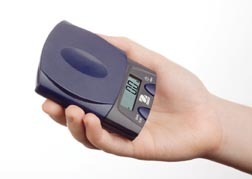 The smallest and most portable electronic scales from Ohaus®. Rugged and innovative design lets you take the precision of an Ohaus® scale anywhere with capacities up to 250 g and readabilities of 0.1 g.
Detecto's T3530 hanging scale comes with a deep 15" (38cm) round stainless steel pan and bows, making it the perfect scale for fish, vegetable or product markets.Stainless steel housing and stainless steel commodity pans enhance the clean, attractive appearance making Detecto's Hanging Dial Scale perfect for any retail or wholesale application.